A4 8.2677×11.6929 US Letter 8.5×11 Bleed 5 mm Photoshop CS6 300dpi CMYK League Gothic: www.fontsquirrel.com/fonts/League-Gothic Arial ..
1991- is clean Creative WP Theme. It is great, professional and easy to use. You can use it for, business, Freelancers, Portfolio Theme, .. Intro. 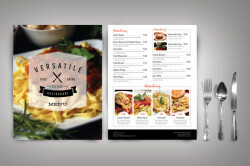 In a world overwhelmed with clashing ideals and rapidly multiplying media platforms, Execute maintains a singular focus: building ..
Get Ready to Impress all your visitor with Jkreativ JKreativ is ultra multi purpose, super responsive, SEO Optimized WordPress Theme with ..
Modern Restaurant Menu Set (Versatile) features fully layered and organized print ready files.File Templates Included• Versatile Restaurant ..